The first tropical storm of the Southern Indian Ocean season has been renamed from Tropical Storm 01S to Tropical Storm Alenga as it continues to strengthen. NASA's TRMM satellite was able to capture a look at the rainfall rates and cloud heights within Alenga recently. 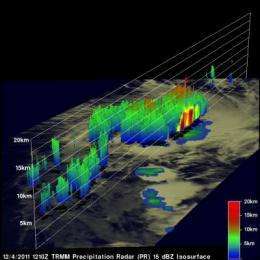 On December 4, 2011 at 1210 UTC (7:10 a.m. EST) the Tropical Rainfall Measuring Mission (TRMM) satellite had a look at the first tropical storm forming in the Indian Ocean this season. Tropical cyclones normally form in this area between November 15 and April 30 so this one was a little overdue. The TRMM satellite is managed by both NASA and the Japanese Space Agency, and obtains rainfall measurements in the tropics. TRMM provided a "top down" rainfall analysis of Tropical Storm Alenga on Dec. 4 at 12:10 UTC (7:10 a.m. EST) using the TRMM Microwave Imager (TMI) and Precipitation Radar (PR) overlaid on an enhanced infrared image from Visible and InfraRed Scanner (VIRS) data. This analysis was done at NASA's Goddard Space Flight Center in Greenbelt, Md. and showed that very heavy rainfall of over 50 mm (~2 inches) per hour was occurring in the forming tropical cyclone near the center of its circulation. Hal Pierce of NASA's TRMM Team at NASA Goddard made the December 4 images from TRMM Data. Pierce said, "TRMM's Precipitation Radar (PR) data is depicted in a 3-D image that revealed a few powerful storms near the storm's center were pushing up to heights of over 12 km (~7.45 miles). The release of energy within these tall towers are often a sign that a storm is intensifying." On Dec. 6 at 4 a.m. EST (0900 UTC), Alenga's maximum sustained winds were near 45 knots (52 mph/83 kmh). Alenga was located in the Southern Indian Ocean's open waters 560 nautical miles west of the Cocos Islands, near 12.8 South latitude and 87.5 East longitude. Alenga was moving to the southwest near 2 knots (3 mph/4 kmh). Infrared satellite imagery today, Dec. 6 showed that the showers and thunderstorms within Alenga are decreasing, and the bands of thunderstorms around its center are weakening. The Joint Typhoon Warning Center noted that this weakening is only temporary as Alenga is forecast to regain strengthen before weakening again two days from now as it becomes an extra-tropical storm. As Alenga continues to head southeast, it is moving into a hostile environment, where wind shear will increase and batter the tropical cyclone, weakening it.